Srirama Navami, is one of the most important Hindu festivals. Hindus all around the world will celebrate the birth of Rama with special prayers, Katha’s and Kalyanam’s. But and why is Sriramanavami is celebrated? Why the life of Rama so important to Hindu’s? how relevant he is in modern times? Lord Rama is worshipped because he is the incarnation of the Lord Vishnu, the seventh Avatar of the Lord. He is idolized as the perfect man, but why? Let us have look at who is Lord Rama and why is it so significant for us to celebrate him. 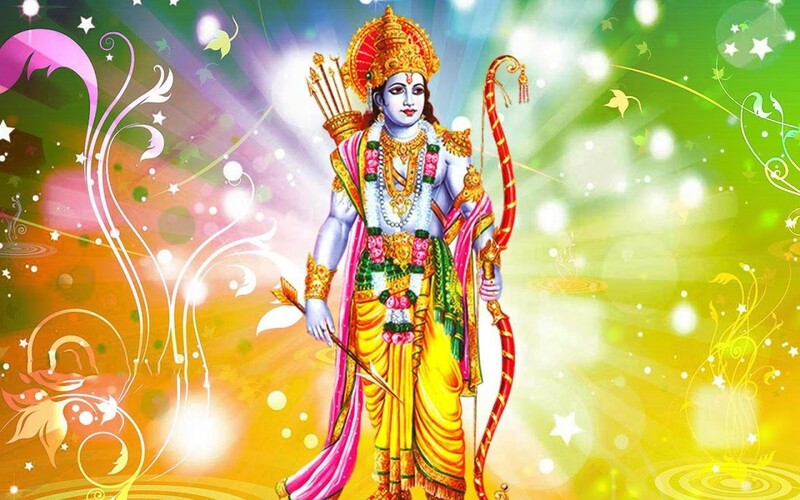 According to legend, Rama was born at noon on the ninth day of Chaitra month in Ayodhaya. Rama is the epitome of perfection, the uttama purusha, fulfilling all his duties towards both family and subjects. In the epic Ramayana, Dasharatha, the Emperor from Ayodhya, had three wives named Kausalya, Sumitra and Kaikeyi in the Treta Yuga, which follows the Satya Yuga and is succeeded by Dwapara Yuga. Their greatest worry was that they had no children, and so they had no heir to the throne in the Ikshvaku Kula or royal lineage of great, pious, wonderful Emperors. Rishi Vasistha suggests him to perform Puthra Kamesti Yagna, through which he can have a desired child. He also tells him to invite Maharshi Rishyasringa to perform this yagna for him. Emperor Dasharatha consents and heads to Maharshi Rishyasringa’s ashram, to invite him. Maharshi agrees and accompanies Emperor Dasharatha to Ayodhya (Capital of Avadha) and performs the yagna. As the result of this yagna, Yagneshwara appears and provides Dasharatha a bowl of divine pudding (Kheer/Payasam) and requests him to give it to his wives. Dasharatha gives one half of the payasam to his elder wife Kausalya, and another half to his younger wife Kaikeyi. They both give half of their portions to Sumitra. After few days all three Queens conceive. On the ninth day (Navami) of Chaithra Masa (first month in Vedic calendar), at noon Kausalya gives birth to Rama, Kaikeyi gives birth to Bharata, and Sumitra to twin boys, Lakshmana and Shatrughna. He marries Sita, th daughter of Janaka and leaves for the forest with newly wed wide and brother Laxmana as promised to the Kaikeyi. Rama is the seventh incarnation of Vishnu, who takes birth by His own will, on Bhuloka (Earth) when Adharma rules over Dharma. He protects all his devotees by vanquishing the roots of Adharma. Rama decided to incarnate to destroy an Asura or person with demonic and evil designs, called Ravana. When adharma is at its peak and dharma is disappearing, avataras take birth to uphold dharma. Thousands of years ago, Sri Rama, who was born on the ninth day of the month Chaitra, is believed to be dharma itself in a human form. Rama Navami is the day on which Lord Rama, the seventh incarnation of Lord Vishnu, incarnated in human form in the land of Ayodhya. He is the ardha ansh of Vishnu or has half the divinitive qualities of Lord Vishnu. The word “Rama” literally means one who is divinely blissful and who gives joy to others, and one in whom the sages rejoice. Ram Navami coincides with Vasant Navratri or Chait Durga Puja. 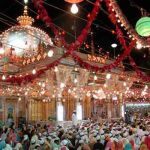 Therefore in some regions, the festival is spread over nine days. 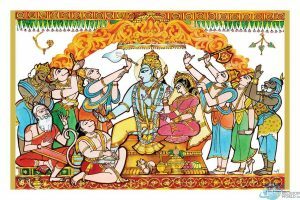 This day, marking the birthday of Lord Rama, is also observed as the marriage day of Rama and Sita and thus also referred to as Kalyanotsavam. How relavant is Rama Today? As Sadguru says, the significance of Rama is not in the situations he faced in his life. The significance is with how much gracefulness he conducted himself through this series of disasters that occurred to him. Though his life became a continuous series of disasters, never once did he waver from his truthfulness, from the fundamentals of life that he set up for himself. People seeking liberation and a graceful life sought Rama because they understood and had the wisdom to see that even with lots of management, external situations can go wrong at any moment. You may have everything organized, but if a cyclone hits you, it can take away everything. These things are happening around us right now. They may not be happening to us, but they are happening to thousands of people around us. “Oh it will not happen to me,” is a foolish way to live. “Even if it happens, I will go through it gracefully,” is a wise way to live. People sought Rama because they saw this phenomenal wisdom. Rama teaches us the basic values of selflessness that it should always be “We” and not “me”. The example of Rama’s sacrifice in accepting the sentence of exile despite having committed no fault just to preserve the word of honor of his father, king Dasharatha, points the way to bridging the ever-expanding parent-children generation gaps. As a son – Respectfully and lovingly obey your father’s orders. Sacrifice your own comfort for your father’s dignity. As a brother – Remain loyal to your brother. Care for him. As a husband – Protect your wife. Fight for her protection and her purity. But there are times when one’s divine path must even take precedence over the path of householder. Do not keep the role of householder as the ultimate role. As a King – Sacrifice everything for your people. Do not worry about your own comfort, your own convenience or your own pleasure. Be willing to put the kingdom ahead of your own needs. As a friend – Rama makes Hanuman realize his self worth, and restores the monkey king Sugriva to his throne. Sita’s sacrifice in preferring the dangers of the forest to the security of the palace offers a stirring example of valuing the marital bond that has become much devalued due to an increasingly casual approach to sexuality and matrimony. The example of Lakshmana’s sacrifice in choosing to stand unflinchingly by the side of his elder brother during the latter’s hour of crisis and thereby gaining a profound mutually enriching bond can serve as an antidote for the superficial relationships that characterize today’s siblings. The example of Bharata’s sacrifice in resolutely refusing the kingdom meant for Rama can offer a signal lesson for the many succession battles among children that break open after the death of a wealthy parent – and sometimes even before the death. It said in the scripture that the word RAMA is so powerful that by uttering the first syllable of RA people get rid of all their sins, and by uttering the second syllable of MA, people attain Moksham(salvation). Ra means the universe, Ma means master(Eeshwara). That means Rama is the master of the universe. In the word RAMA the syllable RA eliminates all sins, the syllable AA takes out the ignorance, and the syllable MA gives peace and happiness. RA means paramaathma(supreme soul), AA means nature, and MA means Jeevathma(the earthly soul). The scriptures say that the most powerful OM and Rama are one and same. Further, when the sound RA from the Ashtakshari Manthram Om Namo Narayanaya and the sound MA from the Panchakshari Mantharm Namashivaya are joined it becomes Rama Tharaka Manthram called RAMA. Thus it becomes a universal manthra for people of all traditions. It is because of such an immense power it is said that chanting the name of Rama will liberate one from the birth and death cycle. Further, there are many stories in Ramayana to indicate how Lord Rama gave Moksham(salvation) to all those who surrendered to Him. Shabari(the old lady belonging to a low caste) and Jataayu(the eagle who tried to stop Ravana from abducting Sitha Devi) are two good examples to show us that anyone who surrenders to Lord Rama gets moksham(salvation).